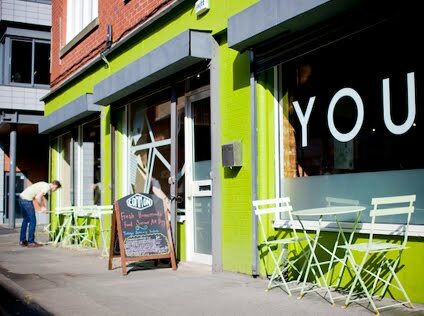 The next Manchester blogmeet will be happening Tuesday March 8, from 6:30 to 8:30 at Common on Edge Street. As usual, all Manchester-area bloggers are welcome to come along, schmooze with your kindred, and drink some fine beverages courtesy of our generous sponsor. This particular blogmeet will be sponsored by leather jacket website I Love 2 Love, which we'll be hearing a bit more about at the event. Thanks for your support, guys. The blogmeet will be held in the Kestrel Suite at Common, which is the room to the back and the right of the area with the booths. No need to rsvp or book a place, just come along. Don't be shy, we're a friendly bunch. We will force you to wear a non-ironic nametag, however. You've been warned. Will try and make an appearance! hi do i need an invite?can i just come ? No invite required, just come along. Hi Kate - only just seen this - I write a NW food blog and am based just out of Manc. can you let me know when the next one's going to be? Would be nice to meet some fellow bloggers! Why do I only ever find out about these things when it's been and gone?! Boo!